The fundamental difference of this patented rig is that both the boom and the horizontal gaff are carried out to the side of the mast by a special offset arm. This provides a totally clean leading edge to the mainsail, free of the windage interference of the mast, which penalizes the performance of conventional mainsails. This offset arm also allows the forward projection of both boom and gaff ahead of the mast, creating a balanced rig that enables easier trimming in the same way that a balanced rudder enables easier steering. The Offset Rig also delivers an important new safety feature by significantly softening the force of the jibe. 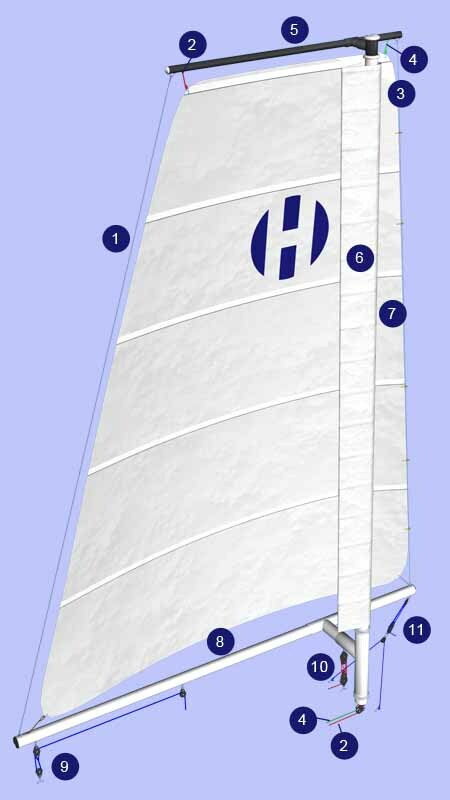 The approximate 20% of the sail area that is carried ahead of the mast acts as a brake by slowing the swing of the sail across the boat during the jibe. A tensioned stay connects the forward end of the horizontal gaff to the forward end of the horizontal boom, and serves to guide sail hanks on the luff during hoisting, lowering and reefing. A similar tensioned stay connects the aft end of the gaff with the aft end of the boom, which assures that they will both act in concert, avoiding the wasteful twist off that has traditionally afflicted gaff rigs. By enclosing the large diameter free standing mast with a light, stiff, aerodynamic sleeve that freely rotates 360º like a wind vane, windage drag is reduced by 75%. The combination of eliminating the windage of the traditional maze of spreaders and stays and eliminating the harmful effect of the mast at the leading edge of the sail creates a rig of unmatched aerodynamic efficiency. Read why this is important by clicking here.